Strengthening our leadership position in molecular biology, Enzo Life Sciences now offers CYGREEN™ Nucleic Acid Dye – a nucleic acid dye that can be utilized in various applications including qPCR and gel staining. CYGREEN™ Nucleic acid dye is a DNA intercalating agent that is used to stain DNA. It is soluble in water, providing higher stability than commonly used qPCR dyes. The DNA-dye complex emits a fluorescence spectra that makes it suitable for qPCR and gel staining applications. In qPCR applications, CYGREEN™ Nucleic acid dye has shown high sensitivity, allowing the detection of low concentration of targets. With an excitation/emission spectra similar to commonly used qPCR dyes, CYGREEN™ Nucleic acid dye can be substituted into existing applications to increase sensitivity and reduce cost. 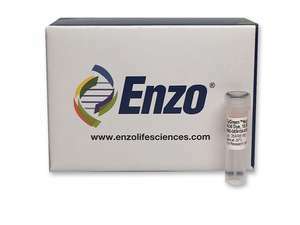 For more information, or to order the CYGREEN™ Nucleic acid dye or other Enzo Life Sciences products, please visit us at www.enzolifesciences.com or call us at 1-800-942-0430.